Shipping Leadtime: 1-3 weeks for small orders. Full pallet quantities can ship quickly). 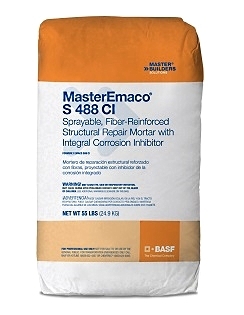 MasterEmaco S 488CI repair mortar is a one-component rheoplastic, shrinkage-compensated, fiber reinforced product that contains an integral corrosion inhibitor, and is NSF 61 Potable Water certified. MasterEmaco S 488CI can be applied vertically or overhead by low-pressure spraying or hand troweling. Contains silica fume to offer high strength and superior performance for structural concrete repairs. One bag yields about .45 Cubic Feet. Vertical and Overhear repair of concrete and masonry. Approved for FDA for federally inspected meat and poultry plants. Manhole, wet-well, sewer and lift station repairs.